The problem seems to be quite common on the E30 models. The fuel and/or temp gauge stops to work from time to time or does not work at all. 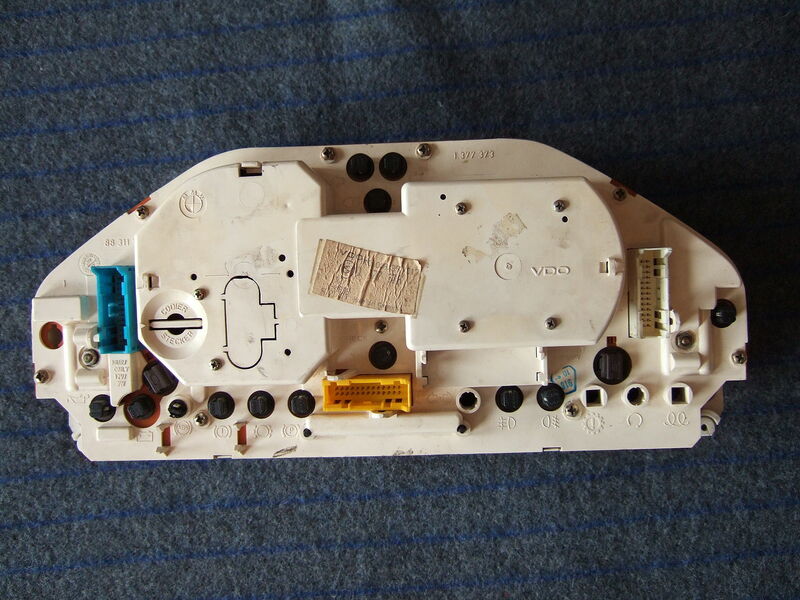 This is caused by bad grounding point at the PCB of the instrument cluster. 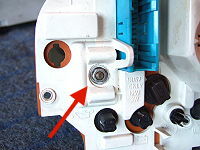 The grounding point is used to move the needle against minimum reading so if you have no grounding connection at all your gauge will most probably show maximum reading. If you recognize this behaviour you are probably suffering from this problem and here is the solution. 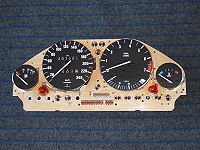 Start by removing the instrument cluster. 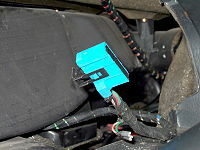 At the back there are two main connectors and two wires to the ABS light (if your E30 is equipped with ABS that is). 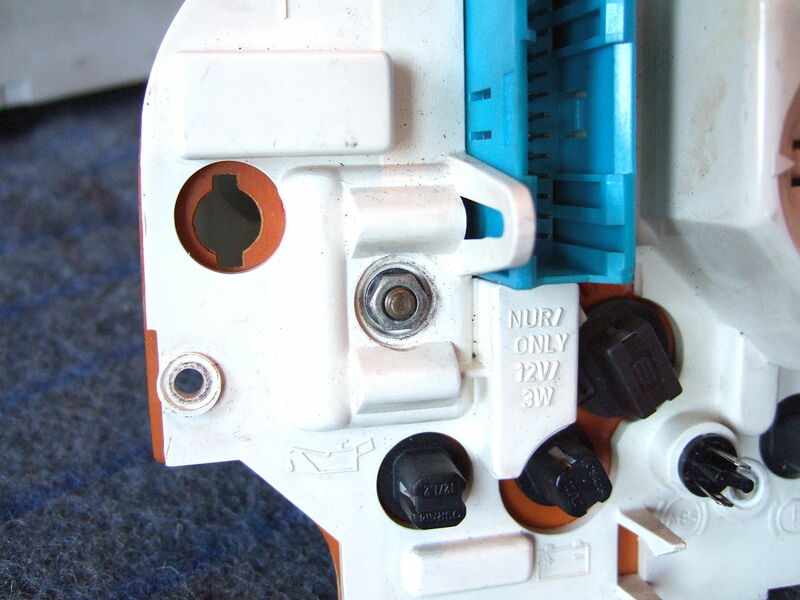 The two main connectors are removed by first pull up the black plastic and then remove the connector. One of the two main connectors located behind the instrument cluster. 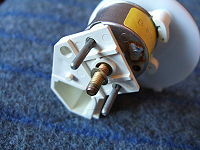 Note the black plastic clip that is pulled up before removing the connector. Remove the baseplate (including the instruments) from the instrument carrier. 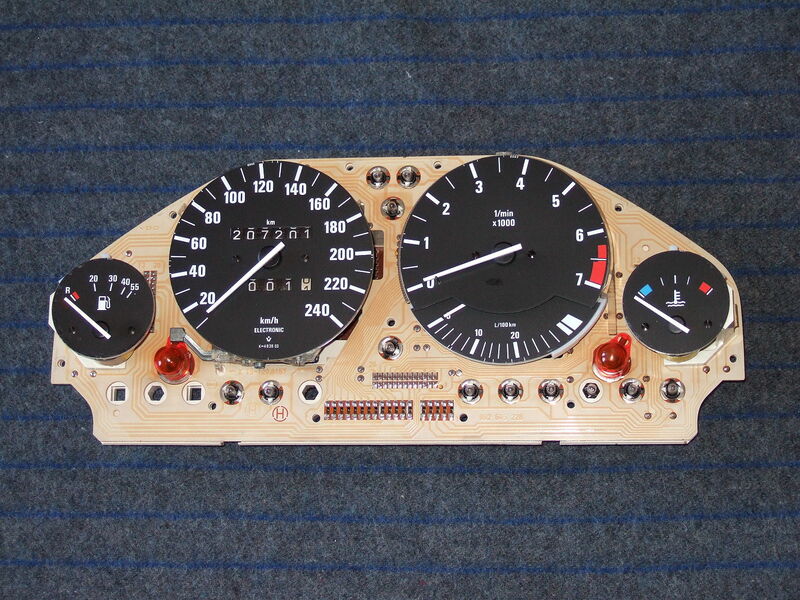 You should now have a unit with the gauges accessible at the front and the screws accesible at the rear. Front of baseplate (including the instruments). Rear of the baseplate (including the instruments). To make the repair you must first separate the front and back. These are held together by nine Phillips screws (having 6 mm hex head). Nine of these Phillips screws are helding the front and back together. Use a 6 mm socket or a a Phillips screwdriver to remove these screws. 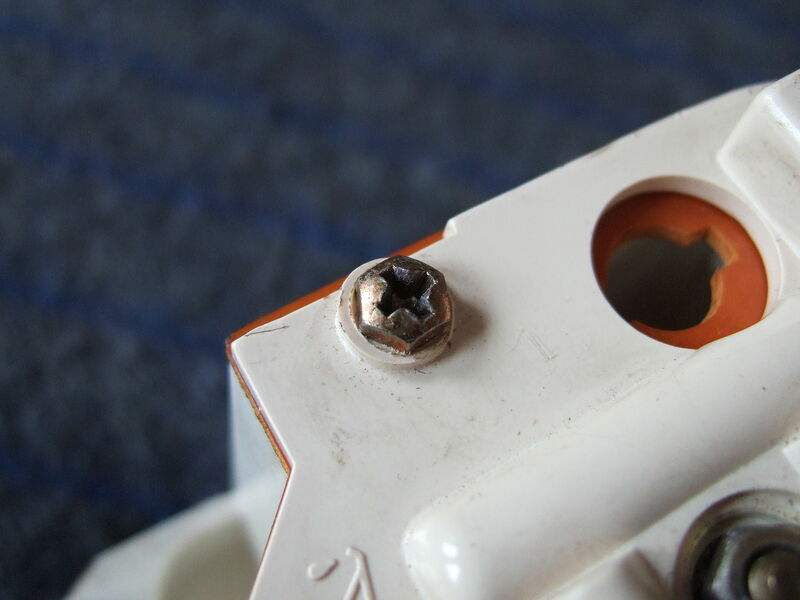 Now it's time to remove the gauge which is attached to the PCB using a 7 mm hex head nut on the rear of the baseplate. This nut is also a part of the grounding point for the gauge. A bad grounding connection can either be caused by a not correctly tightened nut and/or the grounding point on the PCB (the nut, when tightened, will press the gauge grounding point against the PCB grounding point). So remove the nut and then pull the gauge straight up. The 7 mm heax head nut holding the gauge together with the PCB. The gauge removed. 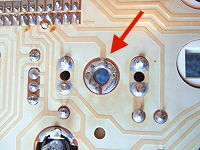 The two grey pins are used for signals from the sensor and the screw in the middle are used for grounding. If not a correctly tightened nut was causing the grounding problem then it is most probably caused by insufficient solder. 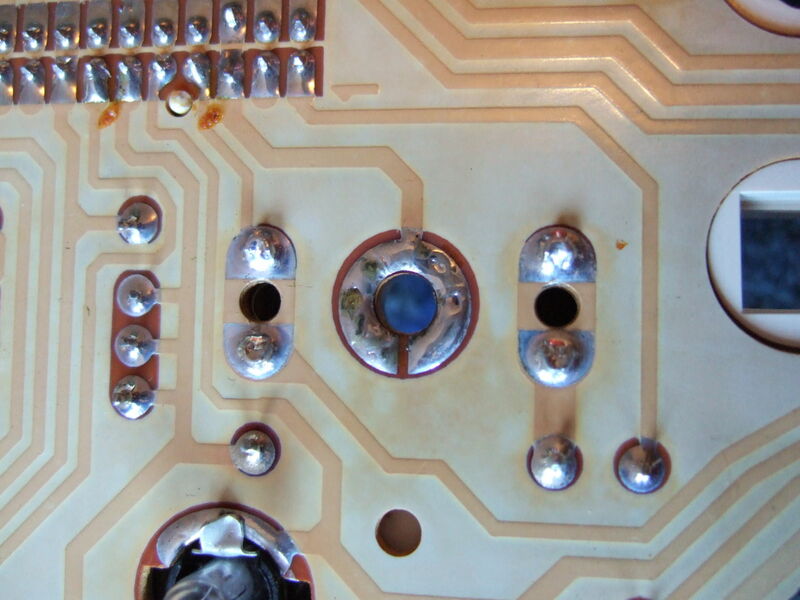 This is easily fixed by simply adding more solder. After solder having been added, see pictures below, simply put all pieces together and you should now have working gauges! 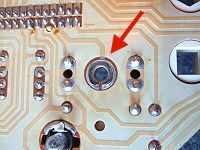 The faulty grounding point on the PCB. 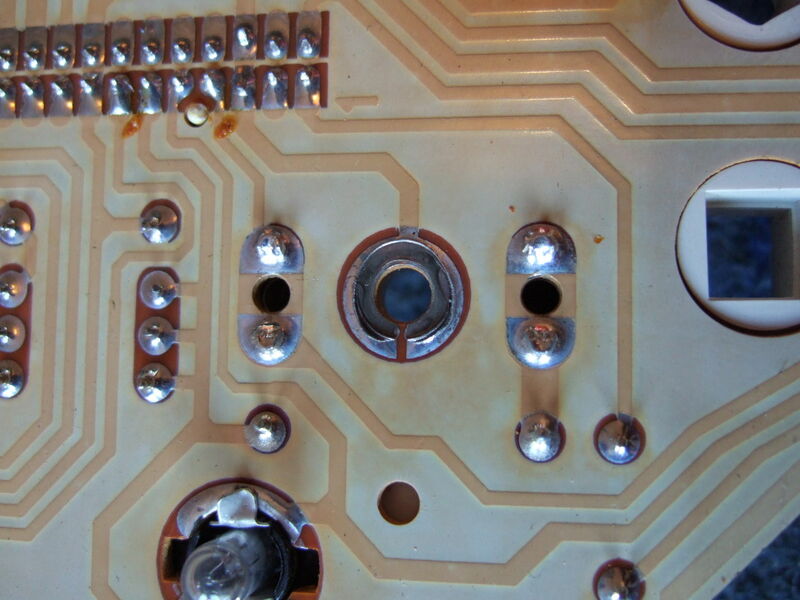 The major part of solders is missing causing bad or no grounding contact at all. 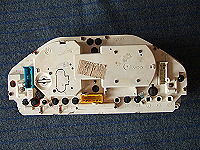 They previously faulty grounding point on the PCB now filled up with new solder providing good grounding contact again.